(FAIR.org) The Syrian government—a dictatorship known for imprisoning, torturing and disappearing dissidents—is easy to vilify. 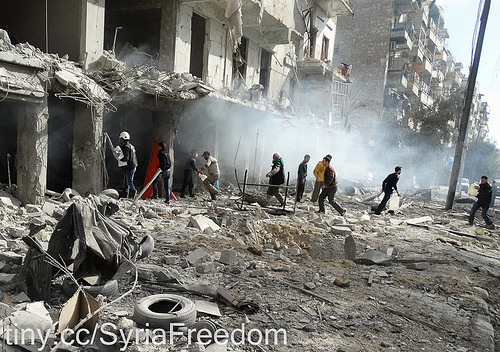 And over the last five years of Syria’s civil war, it has committed its share of atrocities. But there is more than one side to every story, and US media coverage has mainly reflected one side—that of the rebels—without regard for accuracy or basic context. As the Syrian government recaptured East Aleppo from rebels in recent weeks, media outlets from across the political spectrum became rebel mouthpieces, unquestioningly relaying rebel claims while omitting crucial details about who the rebels were. Almost always overlooked in the US (and UK) media narrative is the fact that the rebels in East Aleppo were a patchwork of Western- and Gulf-backed jihadist groups dominated by Jabhat Fateh al-Sham (formerly Jabhat al-Nusra)—Al Qaeda’s affiliate in Syria—along with its ally, Ahrar al-Sham (Daily Beast, 8/8/16; Foreign Policy, 9/1/16). These groups are explicitly anti-democratic and have been implicated in human rights violations, from mass execution and child beheadings to using caged religious minorities as human shields.